3. touchpad () is touched? If the button of HaloCode is pressed, the report condition is met. When HaloCode starts up, if the button is pressed, the LED animation "rainbow" will be played. Report current loudness detected by HaloCode&apos;s microphone. The value range is 0-100. When HaloCode starts up, if the detected loudness is greater than 50, the LED animation "rainbow" will be played. If the specified touchpad (0, 1, 2, 3) is touched, the report condition is met. 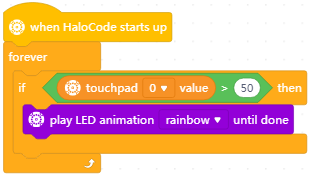 When HaloCode starts up, if touchpad0 is touched, the LED animation "rainbow" will be played. Report the strength by which the specified touchpad (0, 1, 2, 3) is touched. The value range is 0-100. When HaloCode starts up, if the touchpad0 is touched by strength greater than 50, the LED animation "rainbow" will be played. If HaloCode is placed in the specified position, the report condition is met. There are six options: "left-tilted", "right-tilted", "arrow-up", "arrow-down", "LED-ring-up", and "LED-ring-down". When HaloCode starts up, if it is left-tilted, the LED animation "rainbow" will be played. If HaloCode is being shaken, the report condition is met. 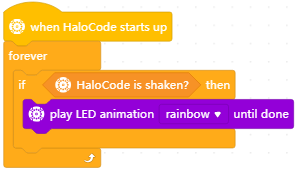 When HaloCode starts up, if it is shaken, the LED animation "rainbow" will be played. Report the strength by which HaloCode is being shaken. The value range is 0-100. When HaloCode starts up, if the shaking strength is greater than 20, the LED animation "rainbow" will be played. 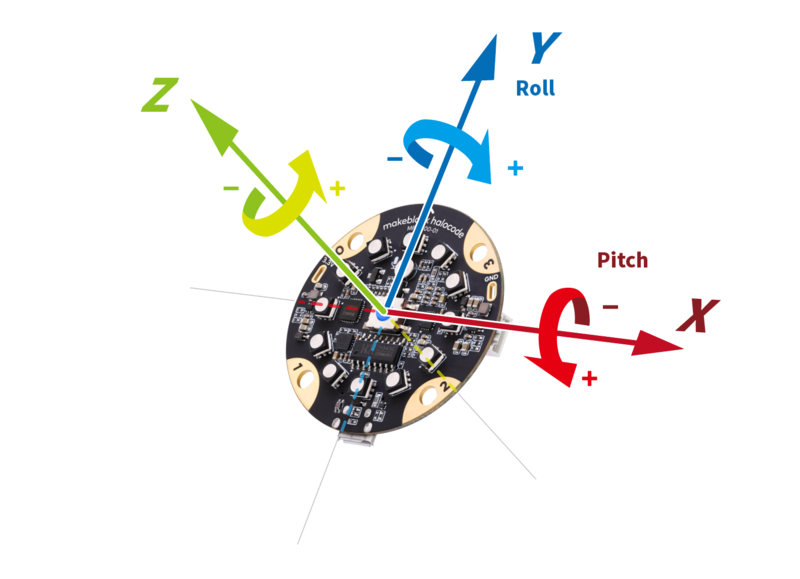 The picture above shows the three axes (x, y, z) of HaloCode and corresponding directions of the roll and pitch. Report the acceleration (m/s²) detected by motion sensor around the x, y, or z axis. When HaloCode starts up, if the acceleration around the x-axis is greater than 10, all the LEDs will light up green. Report the roll or pitch angle. 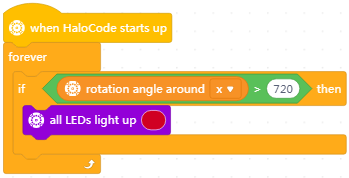 When HaloCode starts up, if the pitch is greater than 150 degrees, all the LEDs will light up red. Report the rotation angle around the x-axis, y-axis, z-axis, or all axes. When HaloCode starts up, if the rotation angle around the x-axis is greater than 720 degrees, all the LEDs will light up red. Reset rotation angle around the x-axis, y-axis, z-axis, or all axes. When the button is pressed, rotation angle around all axes will be reset. Report HaloCode&apos;s timer value (measured in second, rounded to the nearest tenth). 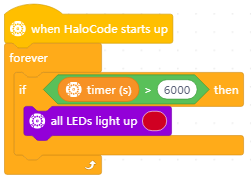 When HaloCode starts up, if the timer is greater than 6000 seconds, all the LEDs will light up red. When the button is pressed, the timer will be reset.